We were very excited last week to pick Corey up from his three-week class at Northwestern. He had a great time and learned a lot, but it sure is nice to have him home again. I still have to eat "soft foods" this week, so you will see that reflected in the menu. We are having friends over for dinner on Thursday so it will be a grilling night. 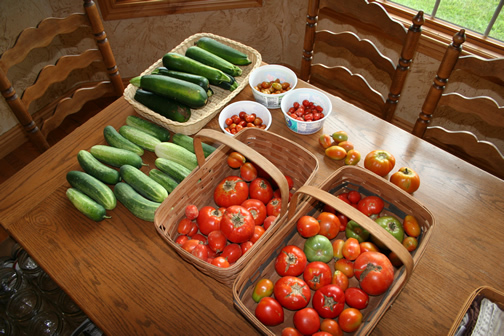 We're also enjoying the fruits of our garden! We have tons of zucchini, lots of cucumbers, and the green beans are finally producing. Even my blighted tomato plants are hanging in there. By the way, thanks to everyone who shared zucchini recipes with me. I can't wait to try some new ones. Here's this week's menu. For more menu ideas, go to orgjunkie.com. Enjoy! Salsa chicken sounds great, thanks for sharing. The bacon wrapped grilled chicken sounds good. Thanks for the idea. Cheese tortellini and sloppy joes, yum!!! I haven't had either one for a long time! I've enjoyed reading your blog. Thanks sfor sharing. I noticed your crock pot recipe. Beginning August 5, I will be hosting Crock Pot Wednesdays on diningwithdebbie.blogspot.com. I hope you will join us. Both of my kids love sloppy joes, but they like them with BBQ sauce. We've been making them for years. omgosh, those tomatoes look WONDERFUL! I think I'll be trying your salsa chicken..sounds delish! Hope you get better soon!